These images show how to ensure that support and load points are on a mesh used as a Karamba shell element. They build on Jeana Ripple and team’s UVA 1-2 Surfaces as Shell example. Download the Rhino and Grasshopper domedemo and images. A few keys to success. Make sure all the supports and loads are targeted to points of the Mesh elements. 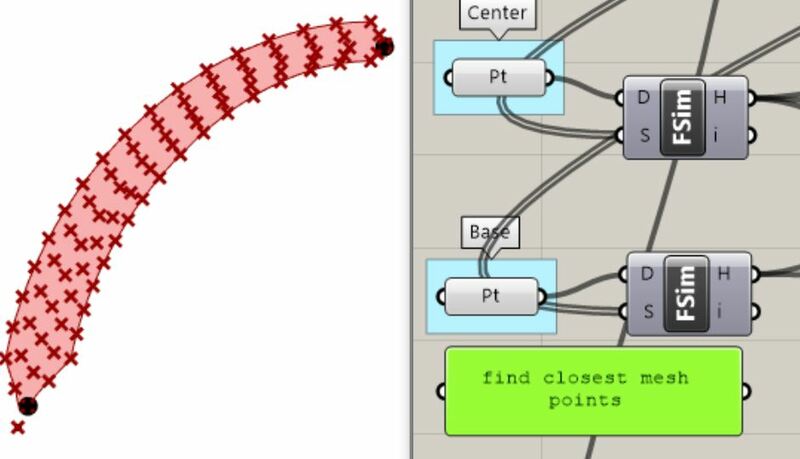 You can construct your own mesh with Curve Network surface. Use the Find Similar Member (FSim) and compare the desired locations to all the points of the mesh. Make sure your units are correct. I mistakenly thought the UVA 1-2 InputSurfacesAsShell was in feet. It is in Meters. If you use it, make the forces much smaller. For example, the Mesh load needs to be about 50 times smaller (Kips/ft2 vs. Newtons/meter2). To generate structural elements from free-form shapes, it helpes to construct a UV curve network that gives structure to the mesh. Setting the minimum and maximum length for the mesh segments in Mesh Options controls the mesh appearance. Generate all the non-redundant points for both the original mesh (to get the center point for the array) and then the multiple arrayed meshes. Use Find Similar Member to search through the original mesh points to generate a new support point and a new center point (for arraying). The found point can be arrayed and input into the Karamba supports module. The center point can be loaded as a load case. For a distributed load, divide the top curve and then find the closest mesh points. 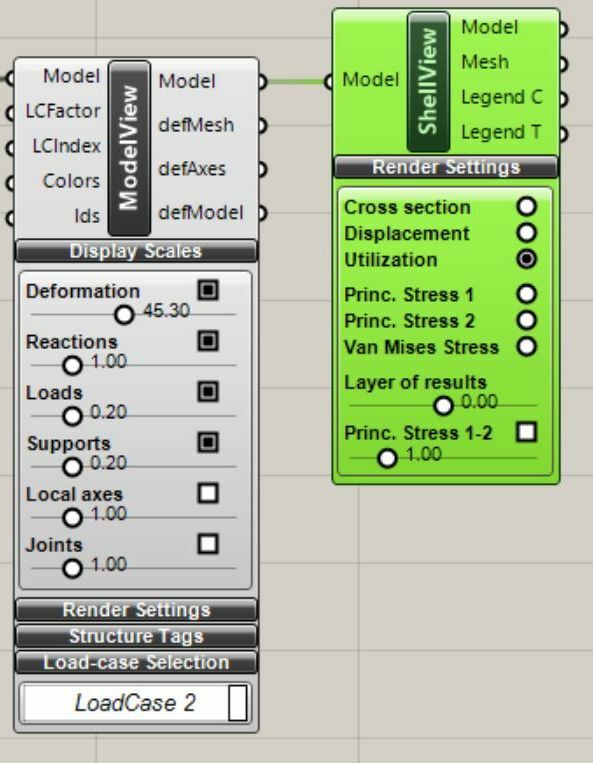 See the Domeshell.gh example to understand how adjusting Mesh Settings (Custom) can change affect the structural result. A base Hoop ring was added to reduce outward thrust. 24 supports are located at the intersection of the naked edge vertices, and 24 ribs are used.